Overall, Whiskas Savory Pate Chicken And Liver Dinner In Meaty Juices is a significantly below average cat food, earning 4 out of a possible 10 paws based on its nutritional analysis and ingredient list. 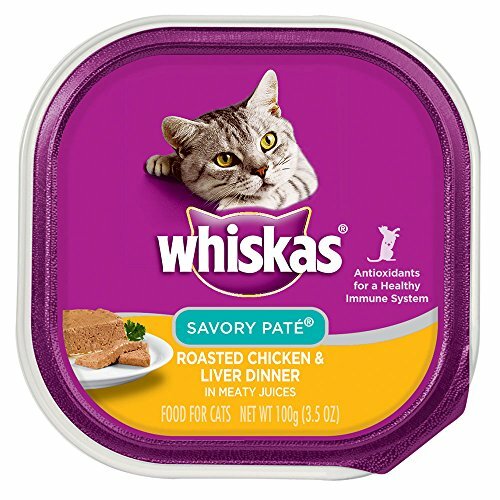 Although not the first product listed (which is the most plentiful), Whiskas Savory Pate Chicken And Liver Dinner In Meaty Juices does contain with its top ingredients chicken and chicken liver which are considered quality protein sources. Using the calculations provided by the AAFCO, Whiskas Savory Pate Chicken And Liver Dinner In Meaty Juices has approximately 67 calories per 100g (19 calories/ounce), which is considerably fewer calories compared to the average of the other wet cat foods in the CatFoodDB. Water Sufficient For Processing, Meat By-products, Chicken, Chicken Liver, Poultry By-products, Natural Flavor, Calcium Carbonate, Sodium Tripolyphosphate, Potassium Chloride, Carrageenan, Added Color, Dried Yam, Dl-methionine, Salt, Xanthan Gum, Erythorbic Acid, L-cysteine, Taurine, Choline Chloride, Guar Gum, Vitamin E Supplement, Zinc Sulfate, Thiamine Mononitrate (vitamin B1), Ferrous Sulfate, Manganese Sulfate, Sodium Nitrite (for Color Retention), Copper Sulfate, Pyridoxine Hydrochloride (vitamin B6), Vitamin D3 Supplement, Folic Acid, Menadione Sodium Bisulfite Complex (source Of Vitamin K Activity).